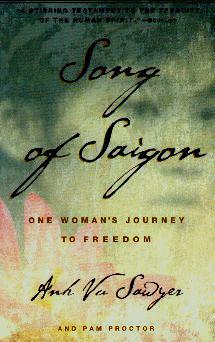 This is the moving story of a Vietnamese woman, Anh Vu, and her tremendous faith despite her perilous situation in Vietnam in 1975. She introduces us to her family and explains how their lives were shaped in that country. How her grandfather, Tieu, once an opium addict, reformed himself and rose to the position of "chef de bureau" of the entire railroad, which was the highest ranking Vietnamese in the nation's railroad system - an incredible achievement. This was before the war in 1940 when Japan wanted military presence in Indochina, which the French gave them. It was also the time that Ho Chi Minh became leader of the Indochinese Communist Party. She tells of her grandfather's death from tuberculosis just at the time that the Viet Minh, or the People's Liberation Army, took over the viceroy's home led by General Vo Nguyen Giap. Tieu, on his deathbed, heard that Ho Chi Minh was president of the Democratic Republic of Vietnam. Soon though, the French retook the south, the Chinese Army came to Hanoi, and the British moved to Annam and Cochin China. Ho Chi Minh tried to get the French and Chinese out and unite the south and north but things led to the French massacring civilian Vietnamese. Anh tells the story of her faith in God and how she and her family escaped to America and the changes they all went through. This is a book of courage, indeterminate will, and the Grace of God. It's a wonderful lesson in how to be grateful for what you have, no matter how little, you have something. Conclusion - A great and inspirational read whether you're a Christian or not.